It is moist and tender beyond anything I’ve ever experienced with brisket, and I have been making brisket for a long time. The flavors are rich and delicious, with lots of caramelized onions that are out of this world! So who is this man with the famous brisket? Interestingly, he’s not a chef. Nach Waxman is the owner of a highly esteemed New York City Cookbook store called Kitchen Arts and Letters. And he’s an expert on cookbooks and food history. With regard to his legendary brisket recipe, Waxman gives creds to his mother for the huge amount of onions used and to his mother-in-law for the pre-slicing technique. 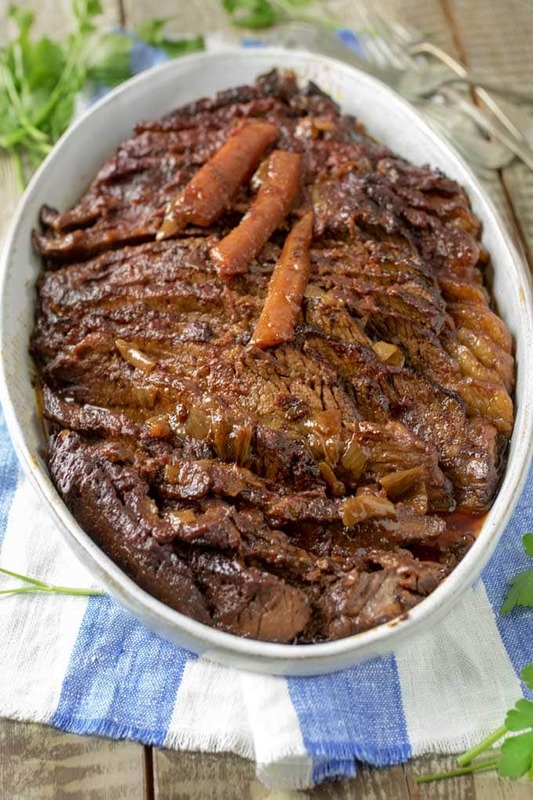 Nach Waxman’s Brisket Recipe first appeared in 1989 in The New Basics Cookbook, which has become one of the best selling cookbooks in the world. Also one of my personal favorites. It’s by Julee Rosso and Sheila Lukens, who authored the famous Silver Palate Cookbook. Now let’s talk about brisket. What is it? Why is it so challenging to cook? Why is it so delicious? Here’s the scoop. Brisket is a tough muscular cut of meat that comes from the breast of the beef. 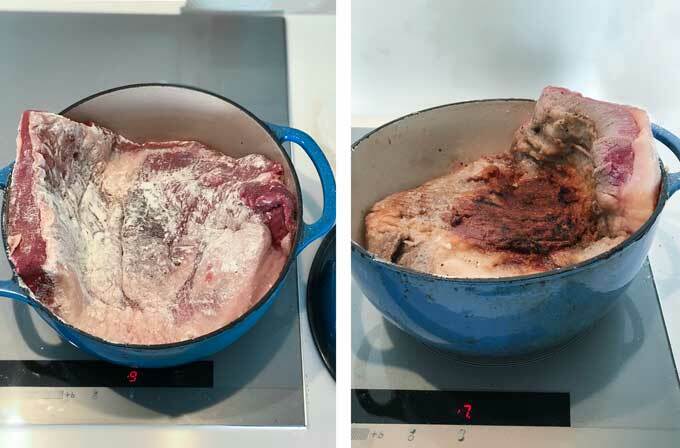 It’s not inherently tender and if not prepared correctly, brisket can end up dried out and tough, which is a very unhappy outcome, especially when you’ve worked long and hard to cook it for a special occasion. But when brisket is cooked well, there’s nothing more tender or delicious. 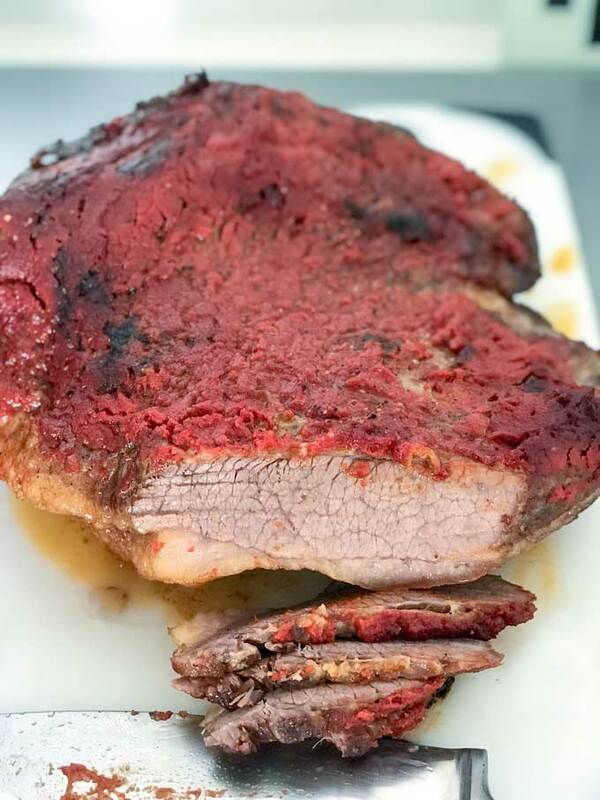 Keep reading and I’ll share all of my favorite brisket cooking tips along with Nach Waxman’s ingenious brisket recipe. WHICH CUT OF BRISKET IS BEST? When you go to the grocery store or butcher shop to buy brisket, you’ll have a choice of first cut or second cut. 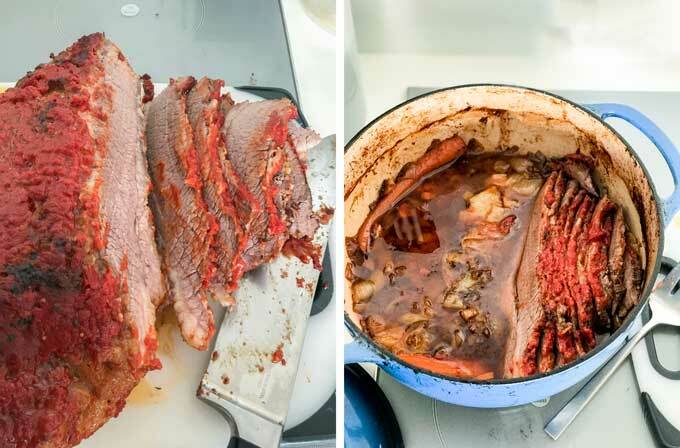 Either cut will work well in this recipe, yielding delicious tender brisket. I do, however, have a preference for first cut brisket, and here’s why. The first cut, often called the flat cut, is the leaner of the two and is fairly uniform in thickness. When you cut it, you’ll get nice even slices. The second cut, also called the point or the deckle, is fairly fatty and uneven in thickness, making it harder to slice evenly and more prone to falling apart. 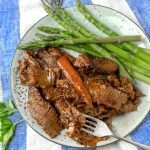 Normally a leaner cut of meat is more likely to dry out after a long braise, but that is not the case for this recipe because the meat is sliced halfway through cooking and then submerged in the fatty juices for the rest of the cooking time, which results in super tender moist brisket. TIP #1 – BROWN THE BRISKET BEFORE BRAISING. Flouring and browning the brisket before braising caramelizes the surface of the meat which brings rich flavor and color to the finished dish. Note that if you’re making this for Passover, you’ll want to use matzo meal in place of flour. Brown it all over. A 6-pound brisket can be a bit unwieldy. As you see in my photos below, I had to wrestle with this rather large brisket to get it browned on all sides. Don’t worry if your brisket seems too big for the pot. Move it around. Push it down into the oil. Flip it over. Get it nice and brown over most of the surfaces. And about fitting it in the pot, I’ve had many a brisket that I thought would never squeeze into my Dutch oven and somehow they’ve all ended up fitting in. Hopefully yours will too! Once your brisket is seared, transfer it to a plate and add the onions to the pot. This recipe calls for eight onions. That’s a lot. No worries if you have a mountain of onion slices coming up out of the pot. They will shrink down and fit perfectly. 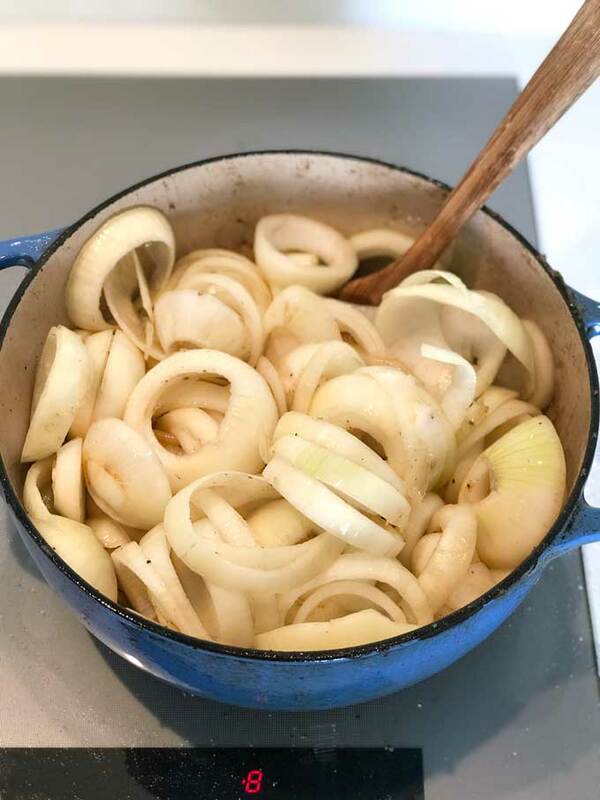 It’s the onions that create most of the tasty braising liquid in this recipe. When the onions are golden brown and have cooked down a bit, place the brisket on top of them. Now comes the step that I love the most: using a butter knife, frost the brisket with tomato paste as if you are frosting a cake. Place a carrot and a few garlic cloves around the brisket. Cover the pot and set it into a 375ºF oven for 1 ½ hours. If you’re wondering whether I forgot to say add the water, I didn’t. This recipe calls for zero water. You will be amazed how much liquid is produced by the onions, carrot and meat juices. Firstly, half-cooked brisket is the perfect firmness for slicing – not too hard and not too soft. Secondly, the sliced meat is returned to the pot and immersed in the fatty braising liquid for the second half of cooking. This acts as a self-baster, with every slice of meat in contact with the braising liquid, resulting in super tender moist meat. Thirdly, when you’re ready to serve the brisket, it’s already sliced. I love this so much! The way you slice meat matters a lot. Meat has a grain which is defined by the muscle fibers that run in one direction. You can see them if you look closely at a piece of meat. These fibers are tough. If you cut along the grain, leaving the fibers in tact, you’ll have to chew through those tough stringy fibers. If you slice the meat against, or perpendicular to those fibers, you’ll literally break them down with your knife, making your meat nice and tender. Below you can see I’ve cut against, or across the grain of this brisket. Each of those little shapes you see in the meat are cross-sections of fibers that have been cut. 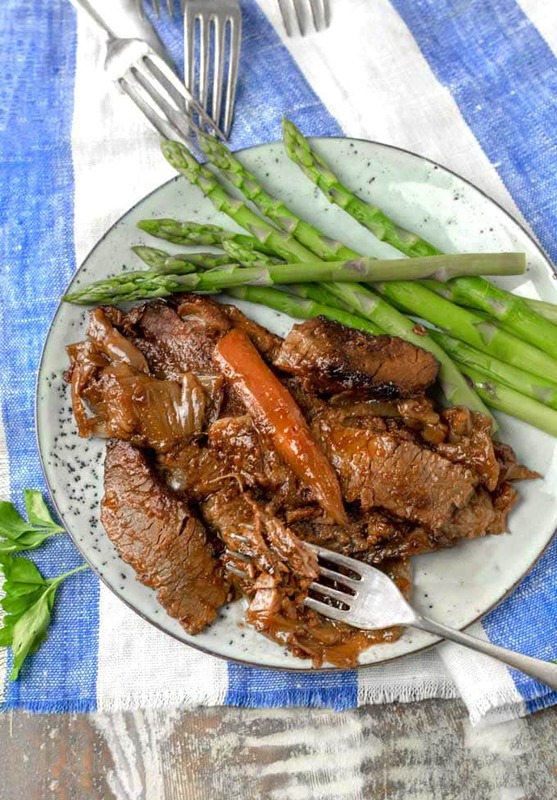 Brisket can be kept in the fridge for up to three days. The flavors only get better over time. Another benefit of chilling the brisket is that the fat rises to the top and hardens and can be easily removed. Brisket freezes well. When I’m cooking brisket for Passover I often make two briskets weeks in advance and freeze them. Freeze Brisket in an airtight container with all the fat and juices. Defrost in the fridge and reheat. 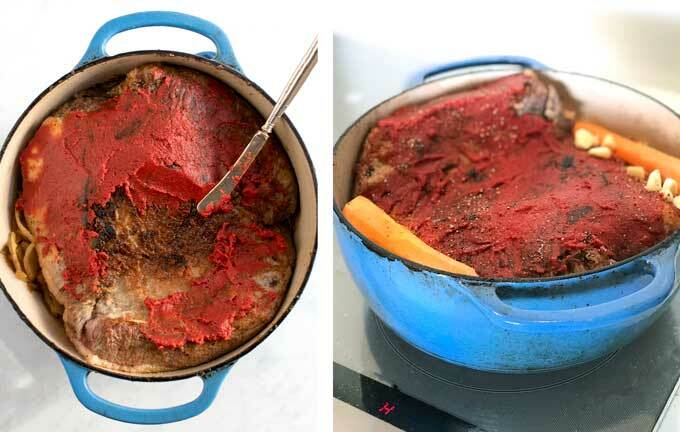 Reheat chilled brisket in a heavy covered pot, in a 325ºF oven for 40 minutes to an hour. 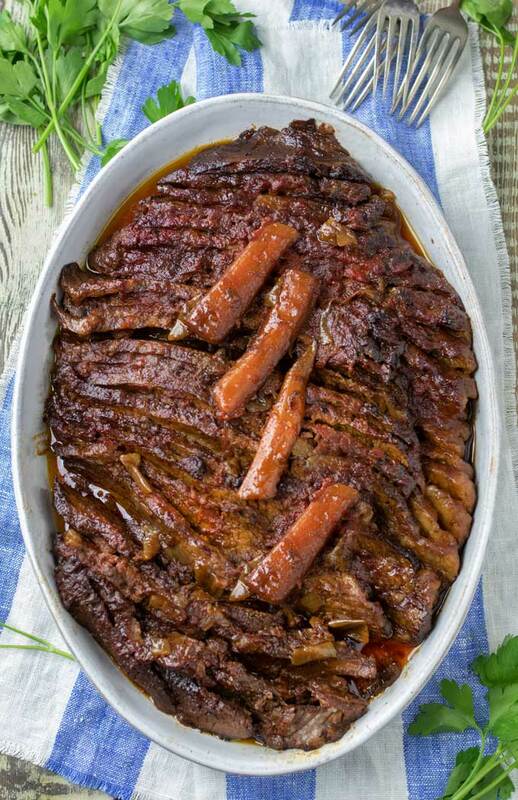 Serve brisket warm from the oven. Arrange the sliced brisket on a platter and pour some gravy over the top or serve it on the side. Nach serves his brisket with potato pancakes, fresh sauerkraut, and green tomato pickles. I serve it with Steamed Asparagus or A Roasted Vegetable Platter, Olive Oil and Roasted Garlic Mashed Potatoes and Fresh Horseradish Sauce with Beets on the side. 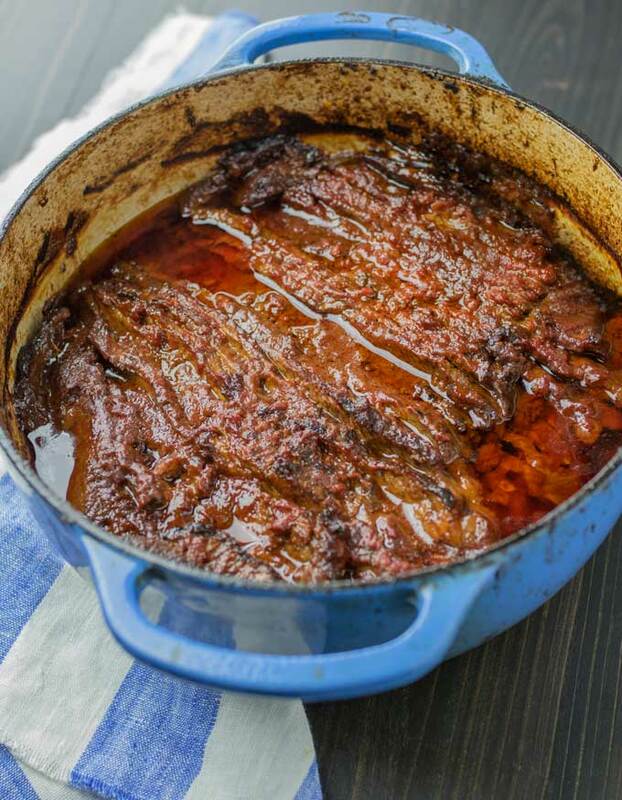 I’ve loved Nach Waxman’s brisket recipe for longer than I can remember. I’ve shared this recipe with all of my friends, family and fellow cooking enthusiasts for years before I ever had this food blog. I’m thrilled to finally share it here with you! If you try this recipe, I hope you’ll come back to leave a star rating and comment. I’d love to know what you think. I’ve got this In the oven right now. I just sliced it and put it back in for the final 2 hours. The instructions are really good. It makes the house smell so wonderful. Getting everything else ready now. Thank you. HOLY MOLY THIS IS DELICIOUS. And those photos are perfection! Is there anything better than brisket in the world? This is such a thorough post, thank you for explaining what to get for the best cut of meat for brisket, and that trick for cutting it in half to keep it juicy is genius. Thank you!